At two public events this autumn, Henley Quakers have promoted ideas of positive peacebuilding. On 25 October Diana Francis spoke on Responding to conflict: building bridges at the Friends’ meeting house, and on 5 November we gave away white poppies from a market stall. In her talk Diana Francis shared examples from her experience of mediation and advising groups in different parts of the world, including Northern Ireland and Nagaland in India. Building bridges helps us create friendships and allies, as well as opening channels between opposing groups. Diana is convenor of a new group called Rethinking Security. Whereas the prevailing belief is that security comes from protecting ourselves from our enemies, in reality humanity faces huge common problems that we need to work on together. 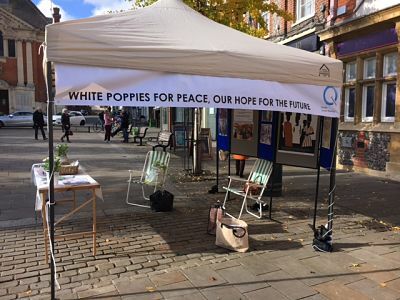 On 5 November, 200 white poppies for a culture of peace were handed out to passers-by from a stall in the market square. Many of the people who took them thanked us warmly, and we plan to come back next year with more.